Take a trip back in time to the age of the Mayans and relive a part of history. The Mayan culture was known for two things. The first thing is that it was a vicious culture with a lot of killing and blood, which is not what this game is about, it is about the second thing, the fortunes and the golden treasures that they were known for. The game invites players to travel back in time in order to grab their share of these fortunes by spinning the reels of this high paying video slot machine. 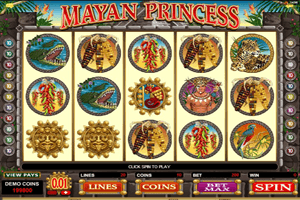 Play Mayan Princess Slot here. All of the symbols that appear on the reels of the game are inspired by the Mayan Culture. These symbols include a golden Mayan coin, a Mayan male warrior, a female Mayan princess, a crocodile, a parrot, a tiger, corn and much more. They all come in wonderful visuals and they appear spinning on the 20 lines and the five reels that the game has to offer. The Mayan pyramid symbol can trigger the Free Spins Bonus. This can happen when players get one of these symbols on the first and the fifth reel at the same time. Players will get to earn from ten to 20 free spins with a 2x multiplier. The logo of the game is wild and can replace other non bonus symbols to form payable combos on the lines of the video slot game.